The public institute Goričko Nature Park and its partners is active in preserving the extensive meadows and reducing the share of overgrown meadows in Natura 2000 Goričko sites, namely also in the framework of the project “The meadows of Goričko” (full title of the project is “Effective management of extensive meadows in Natura 2000 Goričko sites) co-financed under the EEA Financial Mechanism Programme in the amount of EUR 280,466.00. The aim of the project, the implementation of which was launched in March 2015, is to improve management of three Natura 2000 grassland habitat types, the European scops owl and three grassland butterfly species. 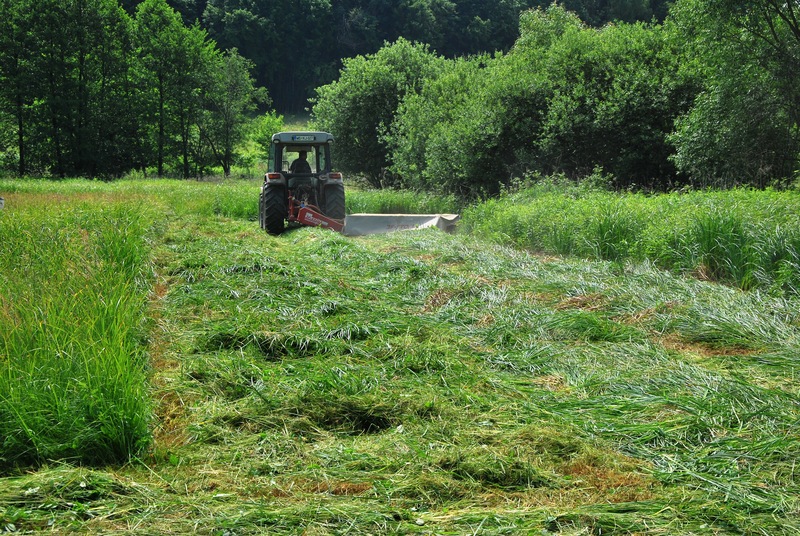 On 5 June they began cutting down 60 hectares of abandoned and overgrown meadows, removing non-native invasive species and wood vegetation, and putting the cut down biomass in storage. This will improve the conservation status of 4 target species of birds (hoopoe, rush, warblers, quail and brown shrike), 3 target species of butterfly (dusky large blue and scarce large blue, marsh fritillary) and 3 of grassland habitat types. The cutting down plan was prepared for each of the 320 plots, namely in compliance with the nature protection guidelines and good agricultural practice. The municipal utility company Šalovci d.o.o. was selected to cut down and remove the wood vegetation, namely under a public selection procedure.